Treadmills are among the most useful workout equipment as they allow you to burn more calories and maintain a lean physique compared to other equipment such as step mills. However, choosing one that fits your needs can be an odious task since manufacturers have released numerous models to suit a large variety of individual needs. Price can easily be mistaken for the most important factor to consider, but the types of workouts you want to use the treadmill for, the space available for your home gym, durability, and the power of the motor is what you should use to narrow the list during your search. Based on the previously mentioned factors, here are our picks for the 5 best home treadmills available for sale online. Launched in 2012, the Weslo Cadence G 5.9 Treadmill was clearly designed for apartment dwellers or those with little space for a home gym going by its folding, space saving design. Its workout features include a user-friendly console with evenly spaced controls for easy management. The screen clearly indicates your speed, time elapsed calories burned and your odometer’s readings. It also allows you to choose from 6 pre-set workout programs designed to meet varied needs and ultimately help you achieve your workout goals. It is powered by a 2.25HP motor that will power all your medium to light workout sessions with ease, making it one of the best for beginners who are still weighing their fitness. Moreover, it doesn’t make a lot of noise when running so you can easily listen to the television over the belt drive. The running belt itself is adjustable and fairly wide at 16 inches x 50 inches so you don’t have to be wary of stepping out while enjoying your jog. 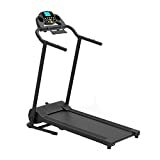 Overall, the machine is easy to set up, fold away and clean, and this easy management makes it an affordable delight for newbies and other users looking for a replacement for their old treadmills. The ProForm 505 CST is a good mid-range treadmill that offers a sturdy design and a range of innovative features designed to help you get the most out of every workout. It safely handles users up to 350 lbs and can be folded and stored away from useful living space when not in use. The running belt is powered by a 2.5 CHP Mach Z™ Commercial Motor that stays cool throughout the toughest workouts and creates high levels of inertia for a smooth powerful feel. Moreover, Proform used 1.9-inch precision-machined non-flex rollers that decrease belt tension, keeping wear and tear to a minimum. This also helps reduce noise and improves grip. Monitoring your progress is vital, and the ProForm 505 CST makes this easy thanks to a large LCD window that displays your mileage, speed, calorie burn, workout time and reading from the KG™ heart rate monitor. You can use the screen to select from 18 professionally designed training programs to select a workout that suits your needs or fitness level. If you are into incline training, then you are in luck as the505 CST offers fully powered automatic 0–10% Quick Incline™ adjustability to help you give your legs the best possible workout. Proform’s has always prioritized comfort, and this is evident from the Proshox cushioning used below the belt to absorb shock and save your joints from impact. The tread belt is also quite roomy at 20″ x 55″ so you won’t feel confined during your workout. Now you can enjoy a challenging workout focused in on your goals. This medium range home treadmill is one of Nordick’s most inexpensive models. It is a folding model that uses the patented space saver design with EasyLift Assist technology and features a 2.6 HP continuous duty motor that can accommodate users weighing up to 300 lbs. The 20 x 55-inch tread belt is equipped with Flexselect cushioning that can be turned on and off depending on your comfort needs. The console features a small 5 inch LED with a track view display to help you keep track of your speed, time, distance, calories burned and odometer readings from the dual grip CradioGrip heart rate monitor. It allows you to choose from 20 inbuilt workout programs and you can also download more programs from iFit if you are subscribed to the program. Moreover, the treadmill can be inclined up to 10 percent and the speed tops out at 10mph. You can listen to your music from your mp3/iPod via the two compatible speakers as you work out but there is no USB charger. . A few users find the motor a little noisy but this shouldn’t matter if you are in a space where you don’t have to listen to anything else. Besides, you can drown it out with the MP# player. 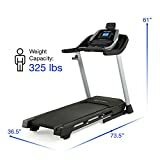 The NordicTrack T 6.5 S is a great choice if you in the market for a budget-friendly treadmill to start out with. This model isn’t designed for professional runners, but it won’t despite home users looking to keep trim all year round. 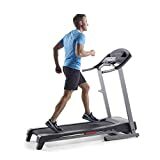 This is a no-frills, sturdily built treadmill that is likely to appeal to those on a tight budget and do not have much space to dedicate to their fitness equipment. While running at full speed isn’t possible due to the relatively weak 1.5HP motor, this is to be expected given the machine’s low price. However, it is good enough for runners and joggers. On the plus side, the motor isn’t noisy, unless you overwork the treadmill. The LCD display is rather basic as it doesn’t present a graphical representation of the workout; however it still provides feedback for time, distance, speed and calories burned but you can only choose from 3 workout programs so you are not exactly spoiled for choice in this respect. The tread belt measures out at 38.5 x 14 inches, which is sufficient for people who are just a little over 6 feet, but taller individuals might find it uncomfortable to workout out as they long legs translate to long strides. While there is no cushioning, but the impact felt isn’t great, especially considering that you wouldn’t be able to run at full speed in the first place. The Confidence Power Plus Motorized Electric Treadmill is space friendly and at just 53 lbs, quite light for a treadmill. The folding design provides for easy storage while the leg wheels make it easy to move the treadmill around. The TR1200i folding treadmill gives you full command of every aspect of your fitness. The 20 X 56-inch tread belt is perfect for walking, jogging or running at full speed and is supported by six compression shock absorbers to cushion your back, knees, and joints from impact. To keep track of your workout, the treadmill comes with a large LCD display that provides workout data that includes time, distance, heart rate, incline, speed, steps taken. Etc. All these are automatically recorded and you can use a USB thumb drive to transfer them to your Club account for periodic monitoring. You can use the console to select from 21 workout programs designed with input from physiologists to expedite your progress. It also has a heart rate monitor and an audio center with a speaker and a headphone plugin so you can listen to music from your device as you exercise. The 2.5 HP motor was designed for longevity and performance so you can rest assured that you’re getting the strongest, most durable piece of technology available. The steel frame is precision engineered to handle every type of exercise and 6 compression shock absorbers support the deck and provide responsive cushioning for your back, knees, and joints. Storage is easy as it folds to fit in small spaces, as is moving the treadmill thanks to the bottom wheels. While you are bound to overheat trying the more intensive workout programs you can plug one alongside the treadmill to keep cool. Purchasing a treadmill that fits into your budget can be a demanding task, but not an impossible one. A treadmill is one of the most popular home exercise machines. Even before you decide to go the manufacturer, you need to arm yourself with some sound advice from a professional or someone who has been using it for a while. If you are absolutely sure you want to buy a treadmill, the first step should be to carry out some extensive research. Since you are looking for the best cheap treadmills on the market, you have to deal with brands that have a name for themselves. It is essential to keep in mind that a treadmill is a machine that can develop mechanical problems. Therefore, it is up to you to carry out research and know what to do or who to call when you experience any difficulties with your machine. Before purchasing a treadmill, get to know about it from your friends or the internet. People who buy such machines in a hurry end up disappointed in the future. Anytime you are buying an item, the price is something you have to put into consideration. The costs of treadmills may vary from $500 going up to $3000, but if you know what to look for, there are plenty of affordable treadmills, which you can use with confidence. If you are looking for a basic machine that will not be used very often, going for a less expensive one is a smart move. Before going to the store to purchase your treadmill, you need to have a budget that will help you spend what you had planned. The most important thing is that the treadmill you settle for offers you an effective workout that enables you to reach your fitness goals. Before you buy a treadmill, you have to know where you will place it in your house. In case you have a large space, you may be able to buy a bigger machine than someone with limited space. Sometimes you might find a space that is not convenient, and as a result, you need to get a treadmill that is foldable. If you are lucky enough, you can get a treadmill that folds flat enough to fit in your closet. Find time and measure the available space you wish to put your treadmill. By doing this, you are sure that the treadmill you buy will fit perfectly in your home and that it will not be just another product among your other pieces of equipment. Once you have done your research and settled on a specific type of treadmill, you need to know what people are saying about it online. Spare some time and go through those reviews one by one. It is quite evident that if a product is not working properly, most of the reviews will be negative. On the other hand, if it is excellent, the reviews will be positive. If you find that the machine you want to buy has some nasty reviews, make sure you look at other options. Client reviews are an excellent guide to purchasing something. Be advised, though, that some reviews may be fake (either written by the manufacturer or by their competitor). The most important reviews you are interested in are from people who are registered as actual buyers and whose profiles have been verified. If you want to go the extra mile, you can even test them out in the store and experience the products first-hand. This will help answer many relevant questions, such as the type of features they have, whether the treadmills are noisy and how easily they can be adjusted to your own preference. A treadmill warranty is very important. The more extended the warranty you are given by the manufacturer, the better it is for you. You will notice that the best treadmills available on the market come with a ten-year warranty on the motor. In some instances, the warranty also covers two years for spare parts and one year for labor. You will notice that your treadmill starts developing minor hitches after using it for ninety days. Once you buy your treadmill, start using it immediately so that in case it develops any problems it will still be under warranty. Different people purchase treadmills for different reasons; some use it to lose weight, others to walk, and others to rehabilitate. You should use these goals to decide what you want to achieve from a treadmill. When buying your treadmill, tell the manufacturer your goals, and he or she will be able to advise you on the kind of treadmill you need. In most cases, treadmills have two categories; running and walking. Therefore, if you know what you want, shopping will be easy for you. As a result of a rise in the number of people looking for fitness, treadmills have become increasingly popular. A treadmill is a good investment especially if you do not want to go to the gym and prefer running as an exercise. 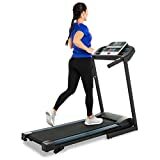 Therefore, if you’re going to buy a treadmill, follow the tips in this treadmill buying guide and you will get a treadmill that will help you achieve your goals and enjoy using it. WOW! Awesome Collection.I really appreciate that you publish an awesome article about the treadmills I’ve been looking at.Thanks for sharing.Keep it up.